I have been on the hunt for a good concealer. I keep getting recommended to try Mac's Pro longwear concealer but I heard great things about the Nars Radiant Concealer as well. Have you tried it? Now I also own many of the Maybelline Color Tattoos from the first line as well as Barely Branded but I saw Inked in Pink and I knew I had to have it. It was over $7 though.. is it me or did they raise the prices on these bad boys? These Forumla X nail polishes are a bit pricey but aren't the colors beautiful? Maybe I'll wait for them to go on sale to grab them. Benefits Moonbeam has been on my list for a while now. I love the iridescent pink and gold in it. Won't be long before I own it =). Benefits Lollitint is their newest tint and I tried it out the other day and looove it! It is quite similar to posie tint consistency wise but the color is beautiful. While I was shopping at sephora over the holidays I thought I would check out the perfumes. I came across Marc Jacobs Honey and it smells so nice. Not overly sweet, I have to say I think I like it much more than the original Daisy. If you saw my monthly favorites then you saw Lush's Ocean Salt on my list. I have been obsessed with trying products from lush. I got a few samples from them and aren't impressed with the ones I picked. I wanted a sample of Mask of Magnaminty but they were sold out and didn't have any samples. I also wanted some soap samples of Sea Vegetable & Rockstar but apparently mine don't give them out anymore. Does your lush still give out soap samples? Well that is my latest wish list. I still have products from my last wishlist to get but I am glad to say that I bought 2 on the list back in October! Benefit's Watts Up & Mac Liquid Strobe. 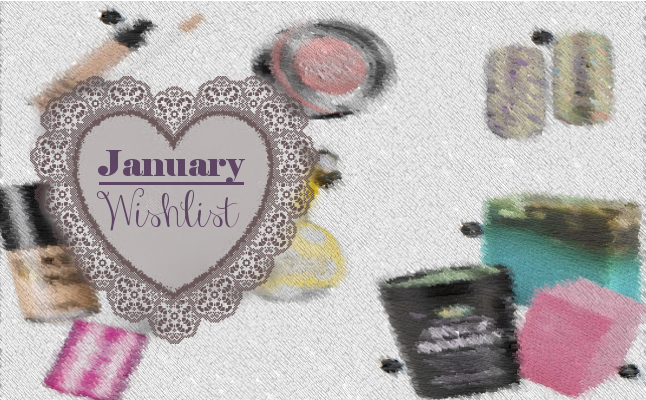 So what's on your wishlist?! Everyone has one, don't be shy to share. Nice wishlist. I love everything on your list.